The 2019 Sugar Bowl will host Georgia Bulldogs vs. Texas Longhorns on New Year's Day at Mercedes-Benz Stadium. The Sugar Bowl is on New Year’s Day at Mercedes Benz Superdome in New Orleans, LA. Get Sugar Bowl tickets to see some of the best NCAA college football in person with tickets from Ticket Galaxy! The Sugar Bowl is an NCAA Division I college football game that occurs around New Year’s. It is one of the most historic and biggest bowl games, and the Sugar Bowl is usually one of the most important games of the season. The Sugar Bowl began in 1935 with the ideas of a New Year’s Day football classic in New Orleans. This would stimulate the city and economy during this time. In 1960, the Sugar Bowl was the first bowl game to be televised across the country in color. The Sugar Bowl has been a National Championship Game as well as a semi-final game for college football. The Sugar Bowl accrued its name from the original location of the Sugar Bowl Stadium. It was located over an area that was once a plantation that produced crops including sugar cane. The plantation’s planter figured out how to crystallize sugar from his sugar boiler, and he became the founder of a National Industry. 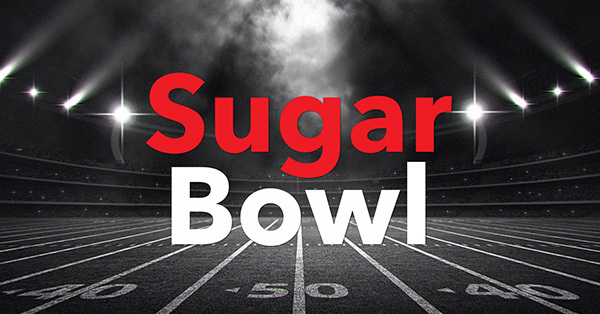 Therefore, the state of Louisiana is the nation’s “Sugar Bowl.” Get Sugar Bowl tickets to see the best of the best compete with Ticket Galaxy!